I'm really into the whole "reduce, reuse, recycle" thing. When I first learned it, though, it was called "don't waste perfectly good stuff" (and some people called it "just being cheap"). I really hate to throw out a perfectly good pair of jeans just because my husband has worn keyholes through the back pocket or had an ink pen explode in the depths of his front pocket. Hey! Those still have perfectly usable fabric on them! And then there are the really expensive jeans you find at trendy stores like Abercrombie and Fitch, with all the strategically-placed rips, worn spots and, I'm expecting to see any day soon, burn holes in them. And you pay extra for that! Hey! I've thrown out jeans in better shape than that! Anyway, I digress (and I rant ;-) ). So besides hating to waste stuff, I have this other affliction called "being a packrat". I diligently save all the old jeans, worn out socks and socks without matches, old curtains I always hated anyhow, and so on. But every so often, some of that stuff comes in handy! Recently it has been pretty cold outside. Well, at least what a native Californian considers cold, such as 40 degrees Fahrenheit... A friend has a particularly drafty door to his apartment, so I made him a draft stopper, also known as a "draft dodger" or "draft snake". It was a simple, fun project. It even allowed me to combine tie-dye with recycling! I tie-dyed some old, dead jeans (mens), and I cut fabric from the legs (2 pieces, each 21" x 8"). I specifically cut the fabric so the ends of the finished tube would be the hems of the jeans legs, which I wanted to show. I sewed the two pieces together to make one 40"-long strip, which I then sewed into a long tube, and sewed one end shut. All my seams are double seams, by the way, to make sure the stuffing stays in. Then it was time to stuff it! The moment I'd been waiting for! Packrat vindication was at hand! I gathered up those old socks (hey, they were clean), the remaining scraps of the jeans, ripped t-shirts and such, and cut them up into small pieces (2-3"-long pieces of socks, for example). I stuffed the draft stopper very firmly, since it needs to be heavy enough to stay in place against a door with wind blowing underneath it. A draft snake can swallow a surprisingly large number of socks! Amazingly enough, it worked! I like the way the tie-dye stripes give it a more snake-like appearance. Then another friend liked it and wanted one too. Yay! Another sock-eating snake! This time, it also became a machine-sewing lesson for my daughter, as well as a recycling project. She cut and sewed this one the same as the first one, except we left off the ties. Here is a picture of the second draft snake. 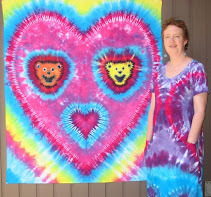 Reduce, reuse, recycle... and tie-dye! I use old towels to soak up excess dye when I dye my pieces, and they get all mottled with various colors. Then I use those colorful towels all over the house for stuff like this--just roll it up to use, and hang to dry afterwards. Maybe not as cute as this duck, though!